Take a trip to the days of Woodstock and Flower Power, when the world was wishing for peace and youthful hippies were trying to expand their horizons in all sorts of novel ways. Click here to play! 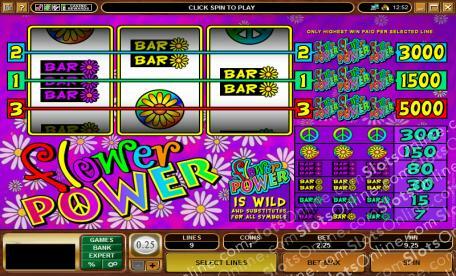 The Flower Power slots take the best of those times - the psychedelic backgrounds and trippy symbols - and mix it with the massive jackpots of modern slots to make for an exciting 3-reel game. While the Flower Power slots do use BAR, double BAR and triple BAR symbols, the rest of the symbols are based on classic hippie symbols. These include bright, happy sunflowers, the ubiquitous peace sign, and the Flower Power slots logo. Loud colors and creative fonts are liberally used for this slots game, which should be a pleasant throwback for anyone who dreams of the '60s. The Flower Power Logo symbol is wild in this game, and can substitute for any other symbol.